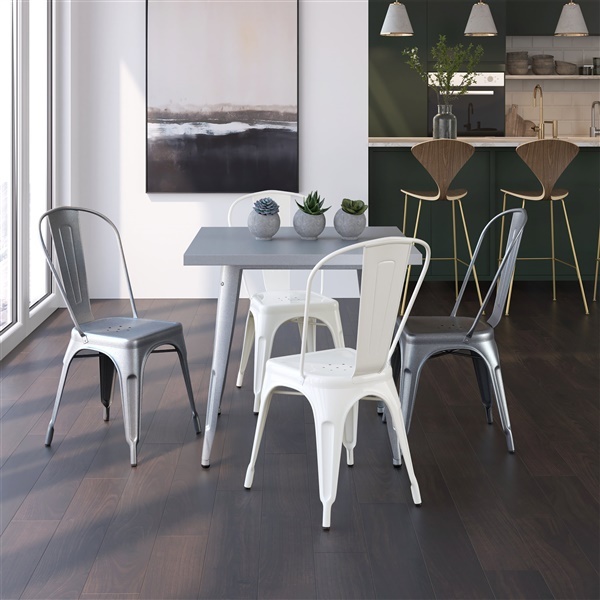 One of the most celebrated designs of the 20th century, the Bastille Caf� Stacking Chair by Inmod adds an industrial yet charming style to any dining space. Available in a wide array of colors, you can match your d�cor or add an exciting pop of color. Constructed of galvanized steel and a zinc finish, they are built for long lasting use. I ordered 2 in navy blue and 2 in yellow! Super cute together! Very attractive in multiple colors with a neutral color palette as a foundation, they look fabulous in my dining room, I couldn't have asked for a better price either, thanks! Attractive in copper - metallic finish brought a much needed brilliance to my kitchen! WOW!!! Ordered several in navy and the others in copper - together they make a GENIUS design! I took a chance without seeing the chairs together beforehand but it was absolutely WORTH IT because in the end it came out better than i imagined. Definitely eager to show pics but dining room is still in the final phases of completion! I am sure I will be back! THANK YOU!! These in lime green are where its at!! They look so cool! I changed the entire style just by adding these chairs - FUNTASTIC! So I highly recommend these chairs to anyone and everyone - my only issue is that they are sold in pairs which made it difficult for me to do a different color for each - it ended up working out as i offered the other to a friend of mine so now we have matching dining rooms basically and i must say the rainbow color scheme looks really chic in both!! great reproduction of the tolix chair design! classic industrial design! excellent reproduction of the tolix chair, blown away by the quality for the price, thanks! Ordered mine in lime! they are incredible! Absolutely perfect for our kitchen dining room! Looks amazing, very well-made and high quality! Thank you Inmod! I bought these to conserve on space when hosting parties. They are super comfortable and extremely sturdy! ProsSolid. Sturdy. Will last a long time I can tell. The Bastille Cafe Stacking Chairs are manufactured in China. The Bastille Cafe Stacking Chair has a weight capacity of 350 lbs.